EPE Sues Danish 'Graceland Randers': The EPE estate is now seeking 1.5 million kroner (US$225,000) for violating the Graceland trademark from the operator of Graceland Randers. There can only be one Graceland, according to the heirs of Elvis Presley. The Memphis mansion draws over 600,000 visitors a year. Right "Graceland Randers" - spot the similarity? "Elvis Unlimited"'s Henrik Knudsen is such a big admirer of the singer that he attempted to recreate the Graceland experience in the heart of Jutland. 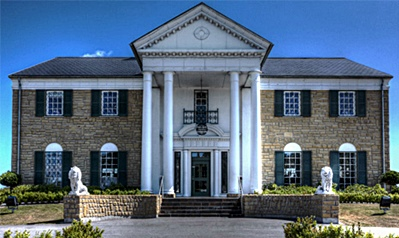 Knudsen owns and operates Graceland Randers, an ‘event house’ that includes the Elvis Museum, the Highway 51 Diner and an Elvis Shop. Since its opening in 2011, it has grown into one of Denmark’s top 50 tourist attractions. But Knudsen’s devotion to The King has ruffled some feathers. EPE has been after Knudsen to drop the Graceland name for years and now its case against him is set for a January showdown in Denmark’s Maritime and Commercial Court. Knudsen, who describes himself as “a professional Elvis fan” said he is surprised by EPE's actions. “When I got this idea back in 2005, there was a lot of media that wrote about this crazy Dane who had this wacky idea and I head nothing [from EPE]. Then in 2010, we broke the news that we would build a house inspried by Graceland and suddenly got a letter from an attorney. But by then I had already trademarked the name," Knudsen told The Local. Knudsen contends that EPE had every chance to stop his use of the Graceland name before he had invested so much into the project. He registered the name with the Danish Patent and Trademark Office, where there is a three-month objection period. "Nobody said anything about it back then. EPE has attorneys in Denmark but nobody reacted. Now they want to do whatever they can to stop me and that's unfair. I did everything official, I did everything the right way. You can’t just come and bully me,” he said. When the EPE filed a complaint after the objection period expired, the Danish Patent and Trademark Office ruled against Knudsen. Rather than simply changing the name of his business, he appealed to the Maritime and Commercial Court. Knudsen makes his living through Graceland Randers, where entry to the museum costs 99 kroner for adults and 69 kroner for kids, and where up to 6,000 items of Elvis memorabilia are for sale. But he insists this is not about the money. “Of course I am running a business, but everything I've done has been with my heart in the right place. I am a die-hard Elvis fan and I was doing this when there was no money involved," Knudsen said. Claus Barrett Christiansen is a lawyer representing EPE in its case against Graceland Randers. “We have said from the beginning that Graceland Randers should find a new name […] We think that Graceland Randers has been very arrogant in this case by refusing all suggestions about a solution,” Christiansen added that part of EPE’s case against Knudsen also involves the sale of “false Elvis products”. I hope EPE loses this case. Graceland Randers actually helps to promote (and sell) the Elvis name. They're not on the same continent. This shouldn't be an issue with EPE, but . . .
E.P.E. must stamp out every Elvis' impersonators. I believe they also do a wonderful Internet radio show from Graceland Randers.